The landscape is parched after a long dry summer and now with frost expected later this week it will have a definite wintery look to it. This painting is about the transition. The cool winds are tugging at the last leaves and before long, bare branches and the blues and browns of winter will prevail. When I started using Alkyd Fast Drying Oils I was very conscious of the danger to my brushes. Even after an hour the Alkyd paint on an unattended brush begins to dry. I decided to reduce the number of brushes I was using in a painting just in case I left one aside for too long, with disastrous results. After a few paintings I decided that the most versatile brush was a standard large round. In this painting, from start to finish, I used a No. 12 round. This is about a half inch in diameter with a slight taper. This single brush was not cleaned between colours, the excess paint was wiped off, but the brush was kept dry. This suits my working method which involves letting a single paint mix evolve through the different stages of the painting. Of course it only works with a limited number of starting colours. I’m using 3 and this ensures that the colours on the palette do not turn into that dirty brown which seems to appear when too many different colours get mixed together. I’m using no liquid, either solvent or medium, at this stage in recent paintings. This helps in my quest to be less graphic and more painterly as mentioned in a recent post. 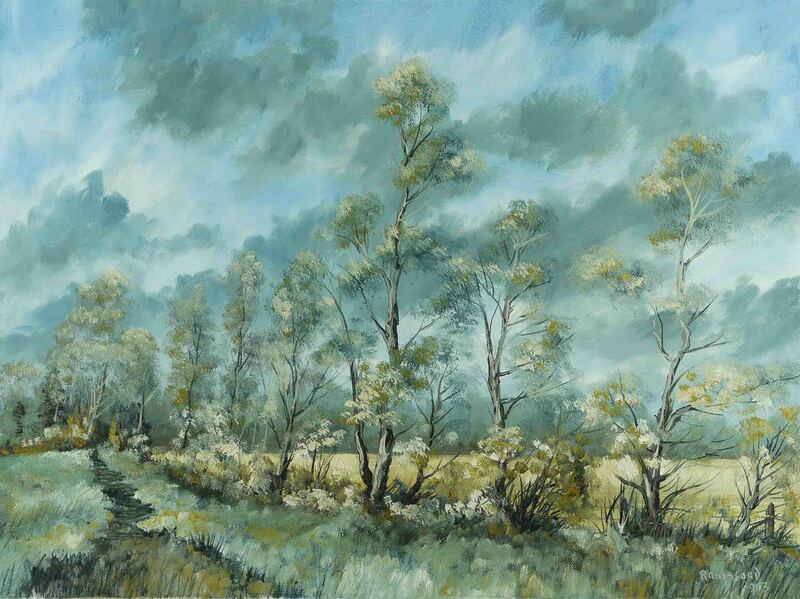 In this painting a small ‘rigger’ type nylon brush was used with plenty of White Spirits for the fine lines. Also, I briefly used a No. 12 Filbert Bristle to blend the sky colours. That was great to see. Especially the use of brushes. I also like the colour mixing. Fun. Thank you for like my painting, its encouraging..But yours are something else.. Thank you Jean and of course I like your paintings. Seeing the world through another artist’s work is always of interest to me. Gracias por el saludo. Soy feliz que he animado a él para pintar otra vez. (También estoy utilizando el traductor).